Natalie and I participated in the Ouachita 50 (pronounced “wosh-i-taw”) this past weekend. This race is just outside of Little Rock, Arkansas and is well worth the 7.5 hour drive. We picked this race primarily because it offered a 50k and a 50 mile option. Natalie wanted to do the 50 miler in preparation for the Tahoe 100 and because I am only capable of running about 30 miles, I thought the 50k option would be good for me. We had never heard of this race before and honestly I can’t understand why it’s as “grassroots” as it is. This race has been going on for 20 years and has a classic portion of trail known as the Pinnacle Mtn. Trail which climbs 1,000 vertical feet in about ¼ mile, and then descends about the same. It’s a real neat mountain/hill formation that leaves a giant smile on your face. The entire trail is exceptionally rocky single track except for the 6 miles of pavement (3 in the beginning and 3 at the end). Apparently this year marked the highest attendance in the race’s history. 111 people finished the 50k and 56 people finished the 50 miler. The venue is just on the west side of downtown Little Rock and is located right at the entrance of Maumelle State Park. This is a great place to camp before and after the race or just grab a shower afterwards. The post race food is my favorite; hot dogs and hamburgers and the finishers awards are handcrafted by the race director. Whole Foods grocery within 2 miles and a Starbucks within 1 mile. This is pretty progressive for Arkansas. What more could you ask for? Off we go… 6am start. It is dark, but since we are on the road for about 2.5 miles it didn’t really matter. By the time we jumped onto the trail there was enough light and fortunate for us because from the moment the trail starts you have tons of rock to negotiate. Running the first few miles is always fun. You get to access your competition and it’s even more fun to know they are doing the same with you. The pace was really slow the first couple of miles but I stuck to my plan to basically just get on the trail somewhere in the top 5 and stay there until the turn around. I didn’t have a watch on today and didn’t have any huge expectations since it has been quite a while since I raced. At about mile 3.5 I decided to go ahead and get out in the front. The Pinnacle Mtn. climb is awesome. You hit it at about mile 4 and straight up it goes on huge boulders. 1,000 vertical gain in ¼ mile is just what I wanted. I figured I might gain a little time on folks and just get out of sight and out of mind from my competition. The trail was extremely rocky and I must admit was far more technical than the Chattanooga trails I normally run on. At the turnaround point, mile 16, my low mileage training started to rear it’s ugly head. This would be the moment of some truth because on an out and back course you have the luxury of seeing your lead (or loss) on the rest of the field. I didn’t have a watch but by my estimate I was about 2 miles ahead of the 2nd place guy. Assuming all goes well, which I wasn’t sure it would, I should be able to make it to the finish in the lead. I passed folks on the return and was fueled by the good energy they were giving me and then when I passed Natalie (in the lead) I was even more psyched. At this point on the trail I knew for a fact that I chose the wrong shoe for this trail. I always race in the Salomon S-Lab and it is an awesome shoe unless you are running on uneven rock all day. My feet were sliding around and I could feel the blisters forming. I’ve always operated on the premise of get it done quick so the pain won’t last as long and today as I write this the pain is still present. So much for that theory. I crossed the finish line in first place at 4:41 and was really excited for it to be over. Now the real work begins… I go take a quick shower and head out in the car to crew for Natalie. I drove out to the mile 36 aid station and within minutes she came through. She looked awesome but commented on how hungry she was. I thought to myself, that can’t be a good sign. She stuffed her face at the aid station (literally) and off she went. 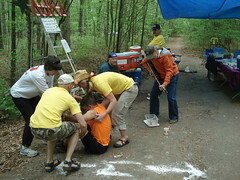 The aid stations were fully stocked with hammer products, PB& J and awesome volunteers that were full of encouragement. They even had ice cream which I thought was pretty unique. I watched a guy come in a few minutes after Natalie and was glad I didn’t sign up for the 50 miler. This guy was hilarious. He laid on the ground for about 15 minutes in excruciating pain from cramps. He ate pickles and ice cream laying on his stomach in the dirt while a blues guitarist was serenading him. An aid station worker commented that maybe he was pregnant since he wanted pickles and ice cream. It was quite a sight. I was glad to see him at the finish line with a smile on his face. I waited for Natalie at mile 43 and the wheels were coming off. I could see it in her face that the pain locker was closing in on her. Natalie finished in the top 10 overall and 1st place female in a time of 9:57. What a great day in Arkansas! 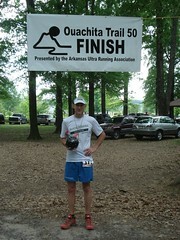 Go do the Ouachita Trail 50. It is a great race with a host of great volunteers and a fun loving race director. Third, that’s me, pt, the guy that came in after Natalie. This is one of, if not my favorite Ultras… Stan & Chrissy do a wonderful job year in, and year out. The volunteers at this race are unbeatable. Although this is one of my favorite races, I’ve never done very well, and this year was one of the rougher ones for me. Had it not been for the care, and humor, I was given at the aid station, plus another runner (Thomas Chapin) giving up a faster time to run with me… I would have never finished the race! Kudos to all the runners, volunteers, and the race directors for another WONDERFUL OT50M & 50K. I am glad I stumbled onto your blog. I recently moved to Ark from Col and have been looking for some good races to get into. Though I am on the other side of the state this would be worth the drive.